You are here: Home / Blog / Personal Blog / We Are Growing Cotton! Last year Coolidge Dam/San Carlos Lake (our source for water) did not have enough water because of the drought. Our alfalfa sustained itself on rain received in August, September and October. Thankfully these recent rains have created some runoff and our dam now has some water behind it. It is capable of holding 1.5 million acre feet. Today it has approximately 150,000 acre feet. Far from full, farmers are at least receiving some water which will allow a small amount cotton to be grown. Farmers are busy preparing to plant cotton and we are no exception! It is very exciting to watch Travis prepare beds. 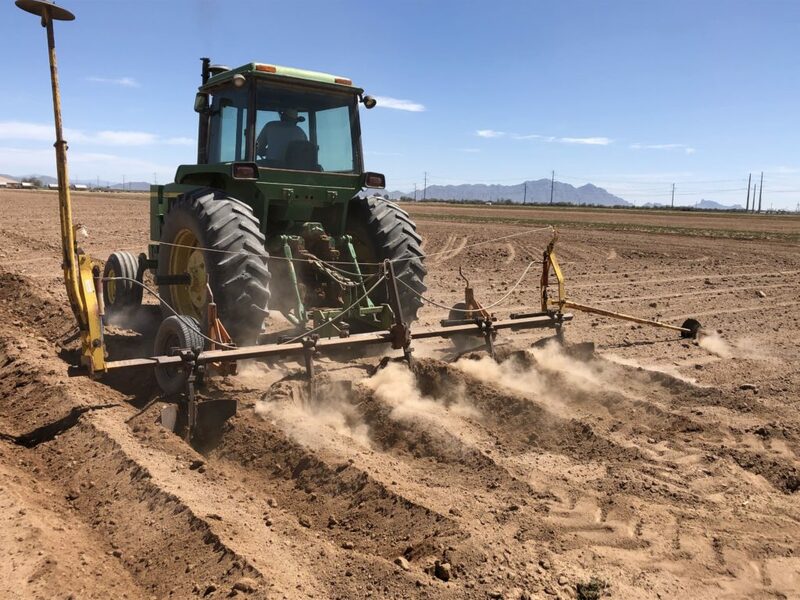 I am sharing a picture of the lister (implement behind the tractor) used to form furrows and mounds (cotton will be planted on the center of the mound). We have set aside a field just for tours! Let’s hope for a great crop and no hail! If all goes as planned, then we should have cotton for our Fall 2019 and Winter 2020 tours. Hope you join us.